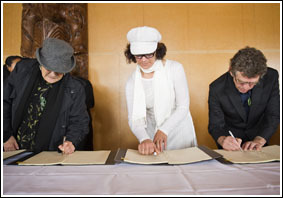 The signing ceremony for the Hauraki Collective Framework Agreement was held at Wharekawa Marae in Kaiawa on the 1st of October 2010. It was with great pride that our Negotiation Team were present, to represent and sign this agreement, on behalf of Ngai Tai Ki Tamaki on this momentous occasion. The Framework is an agreement to help settle shared historical treaty claims in the Hauraki/Coromandel area. 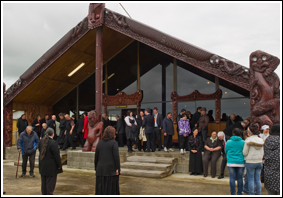 The following 12 Iwi are part of The Hauraki Collective: Ngāi Tai ki Tāmaki, Ngāti Hako, Ngāti Paoa, Ngāti Tamaterā, Ngāti Tara-Tokanui, Ngāti Porou ki Hauraki, Ngāti Whanaunga, Ngāti Hei, Ngāti Maru, Ngāti Pukenga, Te Patukirikiri and Ngā Rahiri Tumutumu. a) offers to the Hauraki Collective of specific items of financial and commercial redress. b) a process by which the Crown and Hauraki Collective will negotiate further redress following the signing of this Framework Agreement. c) the general scope, objectives and procedures for formal negotiations between the Crown and the Hauraki Collective. The Framework Agreement will form the basis of negotiations towards an Agreement in Principle or similar documents to be signed in 2011. Ngai Tai Ki Tamaki negotiators.